Pick out a car seat for Tanner. Such a simple mission in the year 2016. Click the little picture on your computer that links you to the internet. Type in the name of the store you have a 15% coupon code for. Put your parameters in the search bar, make your selection, pay with your credit card and boom you are back to work with a perfectly suitable car seat to be delivered to your humble abode in just a couple days. At least this is how I saw the scenario playing out when my sweet little brown eyed girl, Jess, texted me a picture of a 15% off coupon for Babies R Us that was going to expire soon with the caption “thought you could use this to get a car seat for Tanner.” What a great idea, dragging a car seat from car to car is such a pain. David and I had been tossing around the idea of getting a car seat for our car to make our lives easier with Tanner but also so that when Christi comes out with Annika she doesn’t have to drag a car seat through the airport. Armed with my yellow sticky note of hen-scratched parameters from Jess and the soon to expire 15% off coupon, I confidently clicked on the desktop icon and deftly navigated my way to the proper website. I clicked on the appropriate icons to get to the car seats and immediately my project came to a screeching halt. There are 1040 car seats available to be shipped directly to my humble abode. 312 of which are eligible for 2-day shipping just in case I am in desperate need of said car seat right away. I didn’t know we had so many categories to choose from—infant, convertible, booster, base only, preemies and travel systems. Once you pick from this dizzying array you have more choices some of which I didn’t even know were a choice. You have rear facing, front facing, belt restraints, latch systems, 3-in-ones, 4-in-ones, ones that tout the line “grow with me” and my favorite touted as “the only car seat you will ever need”, but only if you invest regularly in various pieces that move the seat to the next level. This barrage of features doesn’t even begin to discuss the accessories. You can get car seats with cup holders, padded straps, head cushions, side cushions, cooling cloth inserts, easy care cloth covers, covers adorned with action figures or princess ponies, whatever you little one’s heart desires. Two days later, after an exhaustive search of consumer reports and probably every baby blog known to the internet on the subject of car seats, I had narrowed my search down to the perfect seat. As my mouse hovered over the “check out” button, I panicked and opened a new tab just to do a few more minutes of searching to make sure I was getting the best car seat in my price range but also that there wasn’t a better deal than my 15% off coupon swimming around out there in the black hole that is the shopping mecca of the internet. Finally, mentally exhausted but confident that I was getting the best deal, I clicked the checkout button, put in my credit card information and was pleased as punch that Mr. T would be riding in style in just a short few days. 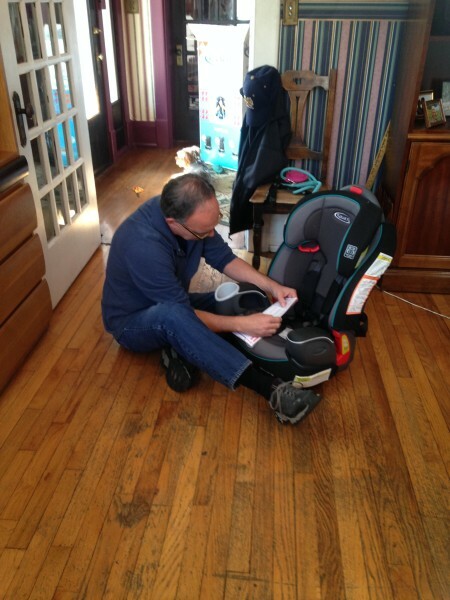 I was elated when a couple of days later the car seat was actually delivered. Yes, I have been known on more than one occasion to order something online that never shows up. David tore open the box, tossed the directions to the side and went directly to the car to install our new car seat. After a few minutes of muttering things Mr. T probably shouldn’t hear under his breath he came back in and grabbed the discarded directions. The flaw in my choice was instantly apparent—this car seat will absolutely be the last one you have to buy as long as your child meets the parameters to be forward facing! Mr. T has reached the age and weight where he could technically be rear facing or forward facing, so the seat would be fine for him. But based on the weigh parameters, Annika may be riding backwards until she goes to Junior High School. After 30 years of marriage, David could tell immediately that I was done. I absolutely hate to shop, I am not a researcher, I do not enjoy the endless hours of side by side comparisons that it takes to make what I consider to be an informed decision. Like a shot he was out the back door headed to the store to return the inadequate car seat. Less than an hour later, David was back at the house with a new car seat that met all the necessary parameters except that it doesn’t convert to a booster. We both decided that it would be easier to just cross that bridge when we got to it. Now Tanner is riding in style, Annika will be tucked in safe as a bug in a rug when she comes to visit and David once again has secured his place in my heart as my Hero. Life is Good. If you enjoyed this post, please feel free to leave us a comment and share with your friends!